Chaetomorpha capillaris (Kützing) Børgesen, nom. illeg. 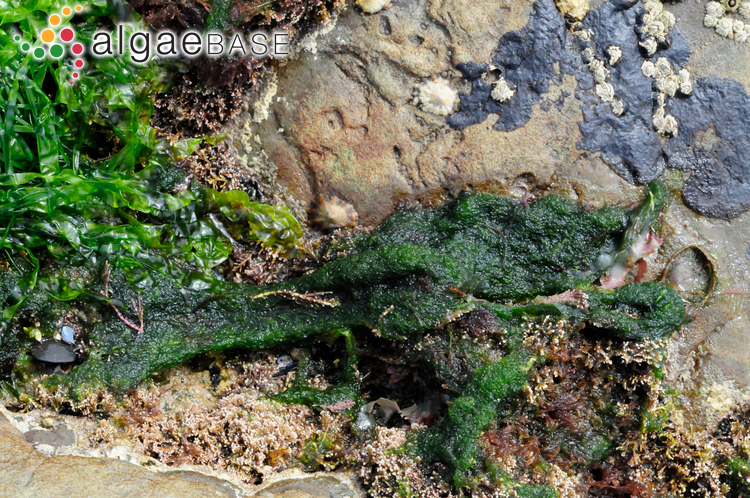 Chaetomorpha capillaris, Spanish Point, Co. Clare, Ireland. 28 Aug 2010. M.D. Guiry. © Michael Guiry (mike.guiry@nuigalway.ie). 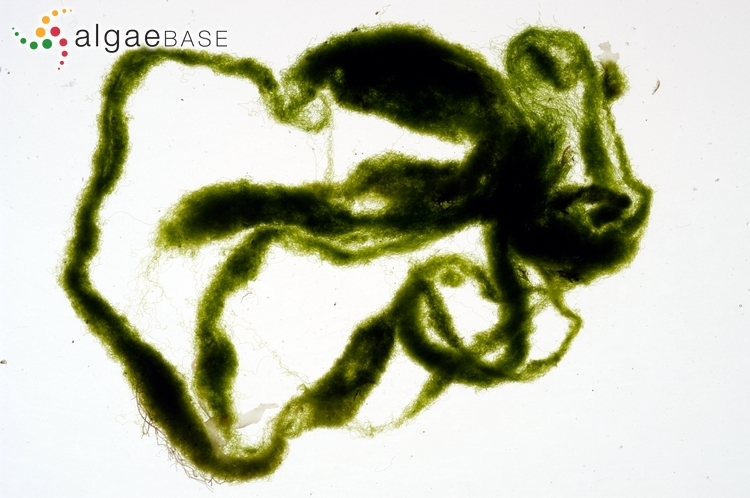 Chaetomorpha capillaris (Kützing) Børgesen 1925: 45, fig. 13, nom. illeg. Published in: Børgesen, F. (1925). 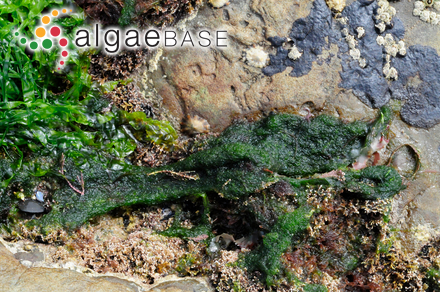 Marine algae from the Canary Islands especially Teneriffe and Gran Canaria. I. Chlorophyceae. Kongelige Danske Videnskabernes Selskab, Biologiske Meddelelser 5(3): 1-123, 49 figs. Type locality: Nice, Alpes-Maritimes, France (Silva, Basson & Moe 1996: 787). Type: L 937, 155...45 (Womersley 1984: 178). Notes: Collector: Binder (INA). Europe: Adriatic Sea (Munda 1979, Ercegovic 1980), Balearic Islands (Gómez Garreta 1983, Ribera Siguán 1983, Ribera Siguán & Gómez Garreta 1985), Corsica (Boudouresque & Perret 1977), Faroe Islands (Irvine 1982), France (Feldmann 1937, Dizerbo & Herpe 2007, Anon. 2017), Germany (Ludwig & Schnittler 1996), Greece (Gerloff & Geissler 1974, Haritonidis & Tsekos 1976, Diapoulis, Haritonidis & Koussouris 1986), Ireland (Cullinane 1971, Pybus 1977, Guiry 1978, De Valéra et al. 1979, Maggs 1983), Italy (Giaccone 1969, Feoli & Bressan 1972), Netherlands (Stegenga & Mol 1983), Portugal (Ardré 1970), Romania (Caraus 2002), Spain (Ballesteros 1981, Romero Martinengo & Romero Martinengo 1982, Boisset & Barceló 1984, Gallardo et al. 1985, Anadón & Fernández 1986), Turkey (Europe) (Güner, Aysel, Sukatar & Öztürk 1985, Zeybek, Güner & Aysel 1993, Apaydin Yagci & Turna 2002). Atlantic Islands: Azores (Neto 1994, Tittley & Neto 1994), Canary Islands (Gil-Rodríguez & Afonso-Carrillo 1980), E. Greenland (Pedersen 1976), Madeira (Levring 1974, Neto, Cravo & Haroun 2001). Africa: Egypt (Aleem 1993), Morocco (Dangeard 1949), Nigeria (Lawson & John 1987), South Africa (Stegenga, Bolton & Anderson 1997), Tunisia (Ben Maiz, Boudouresque & Quahchi 1987). Asia: China (Hainan Island) (Titlyanova, Titlyanov & Kalita 2014, Titlyanov et al. 2015), South China Sea (Phang et al. 2016). South-east Asia: Vietnam (Pham-Hoàng 1969, Kristiansen & Lind 1995, Tien 2007, Nguyen et al. 2013, Titlyanov, Titlyanova & Belous 2015). Australia and New Zealand: New South Wales (Millar & Kraft 1994), New Zealand (Adams 1994, Broady et al. 2012), South Australia (Womersley 1984), Victoria (Womersley 1984). Pacific Islands: Hawaiian Islands (HI) (Abbott & Huisman, 2004), Northwestern Hawaiian Islands (Tsuda 2014). Accesses: This record has been accessed by users 2636 times since it was created. Reed, R.H. (1989). Osmotic adjustment and organic solute accumulation in Chaetomorpha capillaris. British Phycological Journal 24: 21-37.